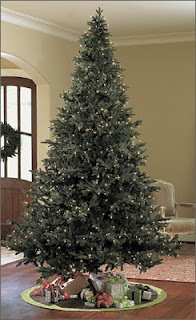 Artificial tree from Ballard Designs. I'm already getting into the holiday spirit, thinking about the type of Christmas tree to buy. Should I go for a live tree with that real Christmas smell or an artificial one? Growing up, we usually had an artificial tree and it never failed to please at that age. I doubt that I'd go for artificial now, though. I dislike the idea of having to store something like this year after year, as I'm on my clutter-free kick at the moment. But there's also a lot to consider before buying a fresh tree. It needs tons of water and doesn't do very well in warm atmospheres (not good for me at all because the heat is always turned way up in my place). What to do? What to do?